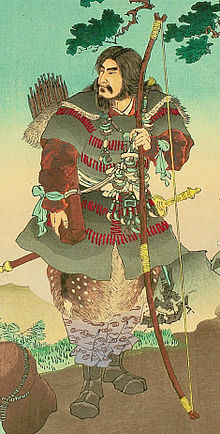 Emperor Jimmu (神武天皇, Jinmu-tennō) wis the first emperor o Japan, accordin tae legend. His accession is tradeetionally datit as 660 BCE. ↑ Kitagawa, Joseph. (1987). On Understanding Japanese Religion, p. 145 at Google Books; excerpt, "... emphasis on the undisrupted chronological continuity from myths to legends and from legends to history, it is difficult to determine where one ends and the next begins. At any rate, the first ten legendary emperors are clearly not reliable historical records." ↑ Boleslaw Szczesniak,'The Sumu-Sanu Myth. Notes and Remarks on the Jimmu Tenno Myth,' in Monumenta Nipponica, Vol. 10, No. 1/2 (1954), pp. 107-126. This page wis last eeditit on 10 Juin 2015, at 19:47.